It’s been more than 24 hours now since Hurricane Irma impacted Central Florida. 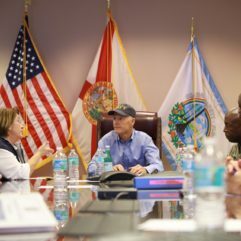 The Orange County Emergency Operations Center (EOC) remains at a level 1 so that Orange County’s recovery can help the community and citizens return to normal day-to-day activities. Orange County personnel have been working around the clock, as well as first responders, Utilities, Public Works and community partners. 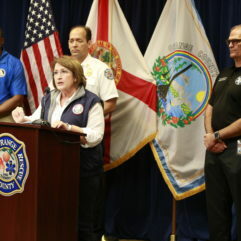 For official Orange County emergency information, visit www.ocfl.net/Irma. The majority of Orange County shelters closed at 10 p.m. last night. The morning of Sept. 12, approximately 90 stranded passengers were being transported back to airports to catch flights. 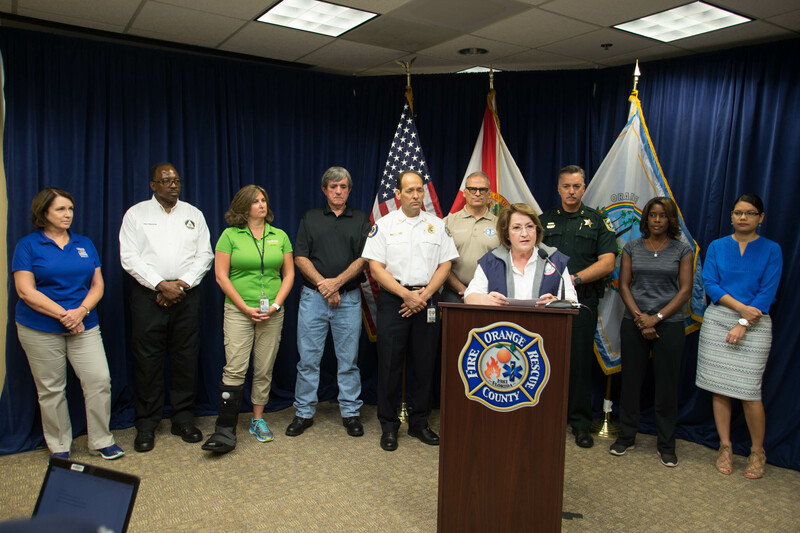 Orange County is hosting approximately 70 individuals in shelters who will need longer-term assistance. The American Red Cross will be stepping in to help with that support. There is extensive flooding in the Orlo-Vista community. 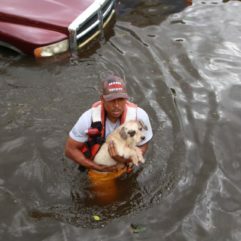 Orange County Fire Rescue (OCFR) and National Guardsmen helped to rescue more than 135 individuals, as well as their animals. Some individuals have stayed behind. Today, OCFR will continue going door-to-door today encouraging residents to seek safety. Similar to our neighbors across the state, Orange County continues to experience significant power outages. Reports this morning suggest that more than 300,000 household remain without power. Orange County monitors nearly 600 traffic signals. With the power out, many of our traffic signals are still out. OCFR reported 35 traffic accidents last night, a few of which involved vehicles crashing into law enforcement. When approaching an intersection and the light is out – drivers are required to make a 4-way stop – even if you do not see immediate oncoming traffic. As of noon today, five sites were open. On Sept.13; five more will open. Please continue to check ocfl.net for location information. If you live in one of our cities, please check with them on how their debris pick up will plan/locations will work. Curbside debris pick up assistance will not begin before Thursday morning. Please check ocfl.net for details. The Orange County landfill is open with regular hours. Garbage service resumed today. This is for regular garbage. Orange County will pick yard waste. If it will fit in your container, Orange County will pick it up. Larger items will be picked up at a later date. Daily garbage service has been moved back by one day in Orange County. If you were Monday pickup, you are Tuesday this week moving through Saturday. Orange County is asking residents to conserve water. The storm placed a considerable strain on our pump stations. Please reduce how often you are flushing toilets. Please also refrain from running washing machines and dishwashers. And please don’t take long showers now. We also ask that if you conserved water in a bathtub, do not drain that water yet. Orange County has dispatched 12 damage assessment teams in the field yesterday, more today. Their focus is on safety. Based on the 311 calls and inspections, we believe that all roads are passable. However, there may be some limbs. Call 311 if you are aware of any roadways that are not passable. Be careful with food that may have spoiled with power outages. Tip, Toss and Cover. There is a lot of water collecting in small items. Empty them to help minimize the potential for mosquito-borne illnesses. PLEASE be careful with generators and chainsaws. This is a time in which accidents can easily happen. One of Orange County’s main goals is to help residents recognize fraud and teach them how to avoid becoming a victim. For more information on the Orange County Consumer Fraud Office and protecting yourself from fraud call 407-836-2490 or 311, or email fraudhelp@sao9.org.